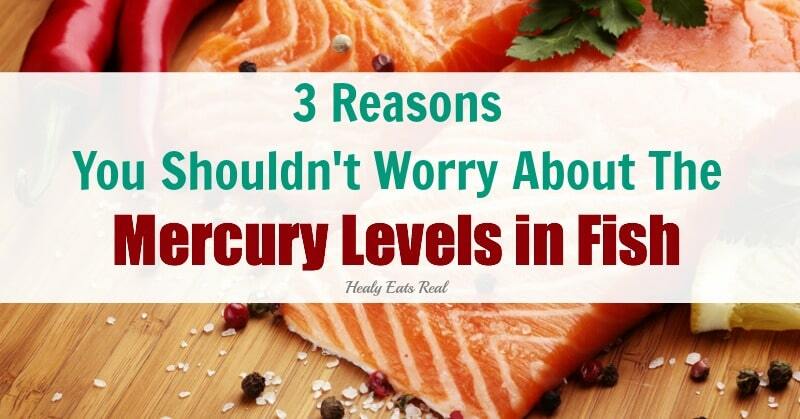 Mercury levels in fish…you hear about it all the time. Why it’s dangerous, why you have to find fish with the lowest mercury levels, but I don’t worry about it and I’ll explain why you shouldn’t either in this article. 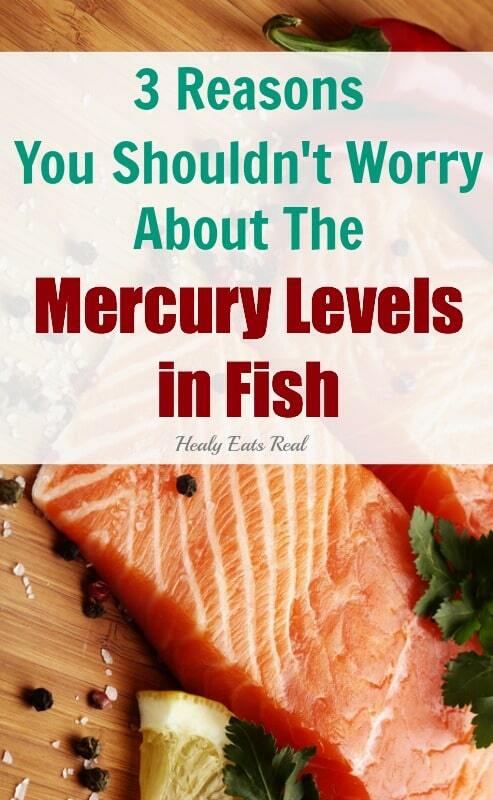 I was worried about mercury levels in fish and avoided it for a long time, so I understand why you would. Mercury poisoning is a serious and scary thing. However, after looking at the scientific research out there, it’s clear that the mercury levels in fish are no reason not to eat it. Read below to learn why. Selenium is a mineral that protects the brain. When selenium encounters mercury, they bind irreversibly, which means that mercury can not then be not absorbed by the body (1, 8). Selenium has high binding affinity for mercury. This means that when the two elements are found together, they connect, forming a new substance. Because fish and seafood is rich in selenium, that mineral binds to mercury so that it can not be absorbed by your body and therefore can not cause damage. If a fish contains more selenium than mercury, then it is safe to eat since the selenium will bind to the mercury and keep it from being absorbed by your body. The great thing is that most fish consumed by people have higher levels of selenium than mercury, making them perfectly safe to eat. Fish is one of the best sources of DHA and EPA, which are omega-3 fatty acids that are essential for regulating inflammation, improving brain health and cardiovascular health (4). Fish is a great source of easy to digest bioavailable protein as well as iodine which promotes good health. According to a 2006 study, fish intake may help reduce the risk of cardiovascular disease—the top cause of death in the United States. Dioxins and PCBs are synthetic waste products that pollute our waters and have been shown to be carcinogenic, meaning that they may cause cancer. It’s only natural that you should be concerned about them and try to avoid them. However, avoiding seafood because of water pollution is not necessary. A typical restaurant-sized portion of Pacific bluefin tuna (200 grams, or 7 ounces) contains about 5% of the radiation you would get from eating one uncontaminated banana and absorbing it’s naturally occurring radiation. All foods on the planet contain radiation. Like every other toxin, it’s the dose of radiation (rather than its simple presence) that determines whether it’s toxic to humans…. Wild fish and seafood is the best option when considering sustainability and health. I like to have wild fish or seafood about 2 times per week, but I know lots of folks like to have it a lot more than that (like 3-4 times per week). 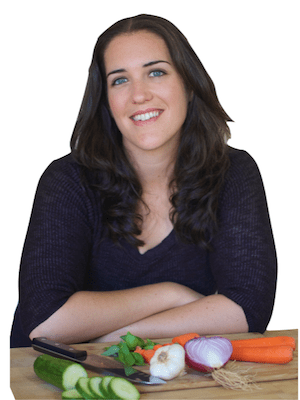 Vital Choice is a great online market that not only provides sustainable wild fish and seafood, but also offers grass-fed beef, organic foods and omega-3 supplements. Click here to check them out! Thanks for the great information. I wonder if any of this research took into account the change in the safe radiation levels that the US Government dramatically increased immediately after Fukishima? Or, is it possible that those changes had nothing at all to do with seafood? Thanks so much for you wonderful articles! 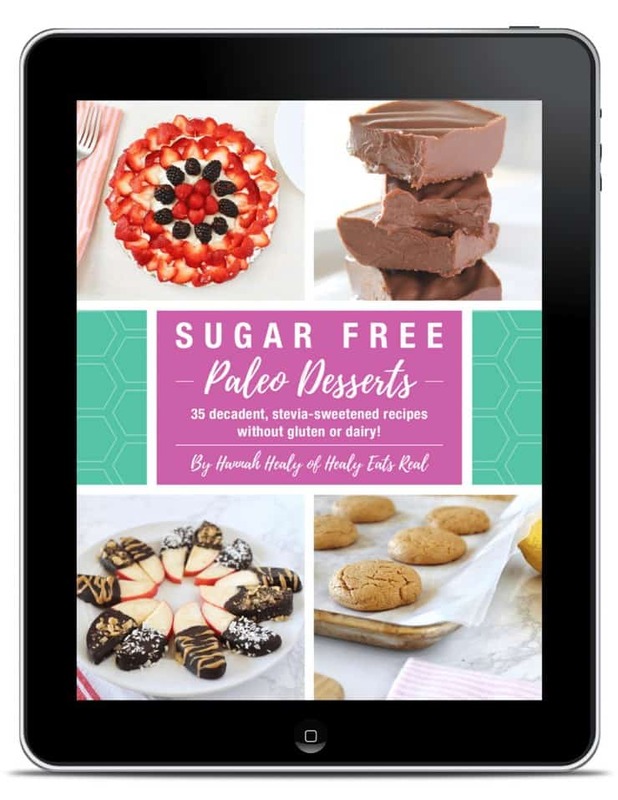 “oh my,… I did not want to scare anyone away from fish – I mean, let’s be honest, there is probably less mercury in meats and eggs, but what is missing in mercury is replaced with other UNvital stuff. I agree that one should stay away from the fish with the highest levels of mercury like the ones listed in this article. Eating different varieties of seafood a few times a week is perfectly reasonable. The article that you linked to is mostly saying that you shouldn’t eat the same kind of fish twice a day everyday. thankx for the info. Now, i have a question regarding if its that bad to eat farm raised fish compared to wild caught? My Dr. insists to only eat wild caught, it can be very expensive if i want to consume wild caught salmon or any other fish around 3 times a week. I read an article saying is better to eat farm raised fish rather than not eating any due to concerns about being farm raised. Any comments/ advice regarding this topic? I’m commenting not to preach that others should not consume fish (as I still do a few times a month) but only to do so with great caution. I am a 35 y/o woman who recently suffered from severe mercury poisoning from eating fish/seafood. I am an educated shopper who consumes ONLY wild caught “safe” seafood (no deep sea or canned tuna, etc) from respected sources. I was eating fish, mussels, and scallops approx 4 times a week. I became ill with numerous aches and serious hormonal/menstrual problems. I tested quiet high for mercury. I didn’t eat seafood/fish for two months and my levels went down. I recommend eating fish with caution and the knowledge that mercury poisoning is a reality and potential problem. Take care! Thanks, Selena, for posting, because until I came to your post, I felt very alone with all the knowledge and research I’ve done. I was starting to think that some of the people behind writing those articles were mercury poisoned to put out such misinformation, and for everyone to blindly celebrate based on these articles is taking a giant leap of hope. I, too, came to this article and wanted so badly to believe that I could just eat any of those fish listed again w/o worry, but it just isn’t so. People need to use some common sense and not fall prey to anything our corrupt FDA jumps in to support. After all, they continue to say mercury fillings are safe, when the EPA will shut down a lake if one were to find mercury in the same amount in it. I would LOVE to believe that eating fish was so safe, because I love fish, and I miss it so dearly, but I’ve read and researched for over 10 years. This is the first time, I’ve heard anyone say it is so safe because selenium is in it. There are many people, some famous, that have been mercury poisoned from eating the “safe fish” on the list. Go to mercurypoisoned.com to learn more from people who have actually been there. I, too, was mercury poisoned ten years ago, severely, from eating the fish they are NOW saying is safe, after Fukishima radiation has occurred – what a joke! I know people who split their time between Hawaii and the mainland, and they know how bad the radiation warnings are, and how the mainland media rarely if ever reports on it. If they did, it would damage the economic system of fisherman everywhere. My life has been turned inside out by the mercury poisoning and the way that doctors are unprepared on how to test for it, let alone treat it safely, or the myriad of health problems that occur years later, like thyroid and adrenal damage, heart damage, as well as gut-brain issues. Taking selenium supplements is a very good idea to help bind mercury when you do eat fish, as fish would be the greatest thing you could eat regularly, if you could do it safely. I’d stick to the smaller fish like sardines, anchovies and tested wild-caught salmon. But tuna, no way, not on a regular basis. Any fatty fish that lives that long and becomes that big has stored a great amount of toxins beyond high levels of mercury. Anyone interested in having a heavy metals test should do an HTMA hair test. Do not let misinformed doctors trick you into testing your blood. Unless you swallowed a mercury thermometer, mercury will not show up in the blood, because mercury moves quickly into being stored into the fatty tissues, e.g., brain, heart, liver, thyroid, etc. Yet, the medical society, backed by FDA and big Pharma, have pushed this useless test on people, giving them false results and no answers as to whether they really have been mercury poisoned. It is much more profitable to treat the numerous diseased conditions that mercury poisoning causes, than to remove the mercury and heal you. Read up on Andrew Cutler’s information on mercury poisoning and how to treat it, if you have tested for it, because there are a lot of quack doctors who will take advantage of you & your $ and re-cycle the mercury toxins into your brain, because they don’t really know how to get it out of your body SAFELY. A good place to start detoxing is with MSM (sulfur compound) on your own will help, as well as eating a lot of protein (carries mercury out), onions, garlic, brassicas and other sulfur foods as a start. Good luck everyone, and always remember there’s a lot of money at stake for different industries, when “said test results” come out. The FDA & Monsanto are in bed since Obama made the head of Monsanto the current head of the FDA. They say Round-up, GMO’s and a host of pesticides which cause the insects guts to rupture are good for you too. Just imagine what that is doing to your own digestive system. They have now found that these insecticides which are labelled “safe” by our government are not only killing the bees, but now our bird population is going down…. Don’t mean to rain on anyone’s parade. I’m giving you some “Food for Thought” when it comes to the gov’t saying anything is “safe” anymore. Thanks for your comment. I’ll take this into consideration. I do want to point out though, that it’s not only the FDA that suggests that these fish are safe to eat. If you check the sources there are a number of other independently done studies as well. I’m sorry that you are struggling with mercury poisoning. I’m wondering if you’ve received any confirmation that your mercury poisoning is in fact a result of fish? I know there are many other sources of mercury that could be to blame like mercury fillings, contaminated water, by way of cosmetic products through the skin and inhalation from emissions from power plants. Thank you for this comment Helen. It was the same thing I was thinking as I read the article. I think everyone should do more research before diving in as if everything is great. Next week, egg Yolks will be bad for us again too…. As much as I love eating fish, there is also another issue that’s not being addressed here about consuming seafood. Read this interview with Sylvia Earle, who is a world renowned marine biologist and pioneering oceanographer, set out to establish ‘Hope Spots’ in the ocean that would work like national parks for protecting marine life. http://www.theguardian.com/environment/world-on-a-plate/2014/sep/18/sylvia-earle-overfishing-seafood-ocean-hope-spots -She remains vocal about her decision not to eat seafood. We are simply over fishing and as she states, “The oxygen that replenishes every breath you take comes from an ocean that is filled with life. It has developed over hundreds of millions of years. It has taken only a few decades [for humans] to disrupt and break those connections. The children of today will be really cross with us if we fail to act on what we know now.” Just food for thought…..
Methylmercury is the dangerous form of mercury as I understand it. Elemental mercury not so much. Is the methylmecury found in fish broken down by humans (unlike the rest of the food chain leading up to the fish itself so that selenium binds to the elemental mercury? Dies selenium bind to methylmercury itself?